Boxbolt is an extensively tested and approved blind cavity fixing solution for connecting to hollow section steelwork or to general structural steelwork sections where access is restricted to one side only. Our technical team can offer practical assistance either over the phone or by fax or if required check your designs or drawings for compliance with safety standards. BEAMCLAMP is an extensive range of clamping products designed for making steel to steel connections without the need for drilling or welding. The clamping system gives the specifier the peace of mind that once the connection is made it has a guaranteed safe working load, and it also provides flexibility for the user when installing and reduces the overall cost. 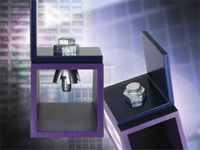 BEAMCLAMP steel to steel connection products encompass a range of steelwork fixings, floor fixings and suspension fixings. The types BA and BB are commonly used together to clamp two steel sections. The type BA has a recessed top to grip the head of a grade 8.8 setscrew or bolt, this allows a nut and washer to be tightened down on to the flat top of the BB using one tool only. Both clamps are available with three tail lengths 1, 2 or 3;. This should be as near to the thickness of steel it is clamping on or slightly less if an exact match is not possible. Packing pieces BF1, BG1 and BH1 can be used in combination with the tail length to achieve a match to the steel flange. BA and BB types are suitable for parallel flanges and flanges up to 8 degrees taper. They can also be used on their own if one piece of the steelwork has been pre-drilled. Please note when using tapered steelwork it is the edge of the steel that we require.